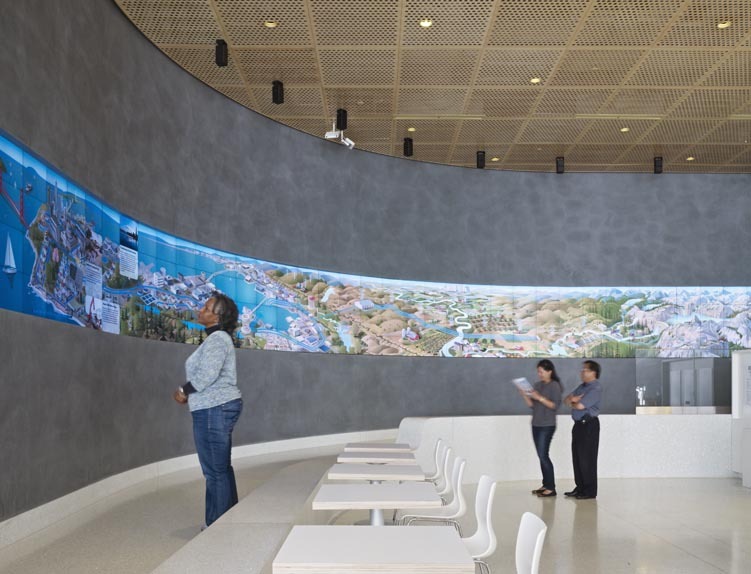 The recently completed San Francisco Public Utilities Commission (SFPUC) Headquarters has been getting a lot of attention for its LEED Platinum targeted green design and its building-mounted wind turbines. What a lot of people don’t know is that, although the building was envisioned as a showcase for sustainability early on, it wasn’t originally for the SFPUC. In fact, that site used to be occupied by a state office building, which was damaged in the 1989 Loma Prieta earthquake. When the City of San Francisco bought the site in 2000 for $2, the plan was to demolish the building and replace it with a new annex for city hall workers. 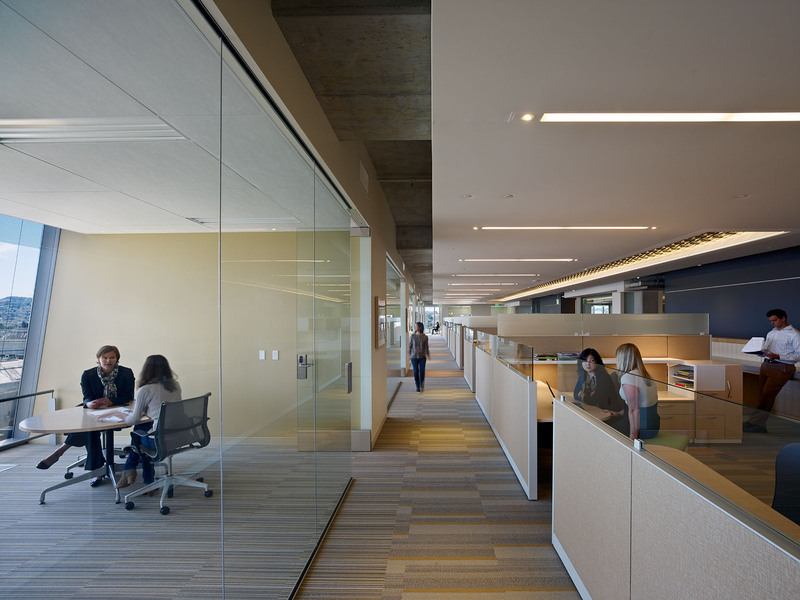 We led the workplace programming and interior design effort as part of the joint venture team of KMD Architects and Stevens Architects, who designed the core and shell. The project was entitled (which is no small feat in this City) and the team was set to proceed with work. When rents dropped in 2002, though, the project halted. A few years later, when rents rose again, the SFPUC purchased the project to consolidate its employees who were working in leased space throughout San Francisco. As part of the original design team, we reprogrammed the entire 13-story building. It was a peculiar situation — the building hadn’t been constructed, but it might as well have been: the building height and floor plate were set. So we had to work with the SFPUC to figure out how to fit them into what was essentially an existing building — even though it didn’t exist. Some of our biggest challenges centered around the green heating and cooling solutions, given the constraints of the existing floor-to-ceiling heights. We moved from an initial chilled beam ceiling design to a raised floor solution, where people can individually control how much air comes through each air vent. 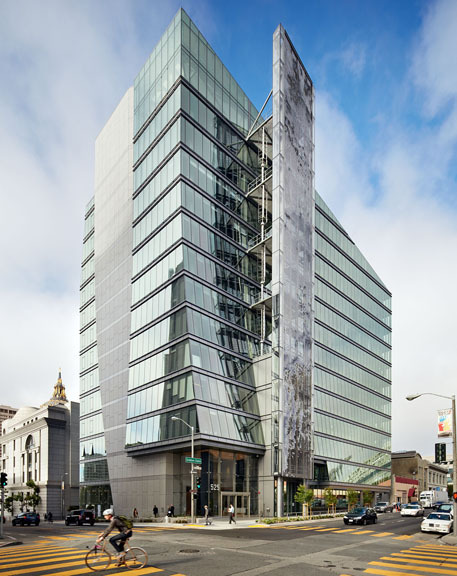 We also learned from some of the difficulties that emerged at the San Francisco Federal Building, which, like our building, has floor-to-ceiling glass—to shield the southern facade from solar heat gain, the Federal Building relied on exterior south-facing sunshades moved by two pivot arms. But the system sometimes developed mechanical troubles, causing the arms to lock in place. 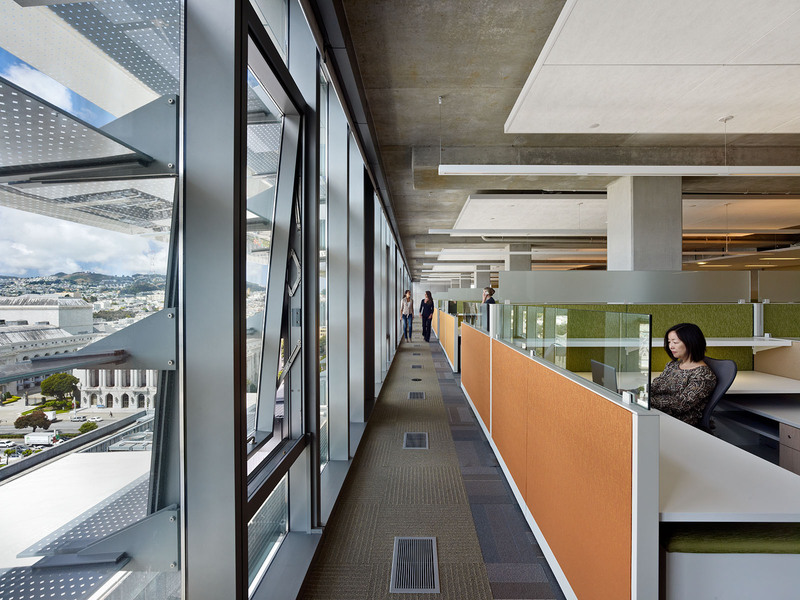 For the SFPUC building, we incorporated an interior system instead, with fixed sunshades along the south facade and light shelves that bounce daylight deep into the space. Window blinds are attached to sensors that move them automatically to block the sun depending on the time of year. The SFPUC has six different business divisions with 35 different user groups. We met with everyone, trying to determine their needs, their expectations, and the ways that a new workspace could open up new possibilities in their workflow. We presented a series of diagrams showing how we could break the workplace environment into neighborhoods. No individual closed-door suites. Different managers had different ideas about space, so we wound up reprogramming and reconceiving the interiors. In the end, we did provide a few private offices. But the offices are primarily open, with plenty of areas for collaboration, articulating organizational workflow in a rich “town plan” layout of program areas and activity zones. It’s not possible to make a highly green building unless everyone is willing to find new ways of working together. The idea of executive offices with windows is very entrenched in this country, but we need to place the public spaces, conference rooms, and break rooms along the windows so natural light can penetrate into the interiors. The hierarchy of spaces is relatively simple. For instance, we tucked one large or two small conference rooms in the northeast corners on every floor. At the southeast corners, every other floor has an employee break room. The alternating floors have meeting or training rooms. We use colors to identify them. The north conference rooms are blue; the south break rooms and training rooms are green. Each floor has a central core area with an employee pantry area with coffee maker, small refrigerator, and curved coffee counter where people can sit and talk. There is also a copy and printer center with a zone of high-density files at the same location on each floor. The idea is that people from different groups will interact with each other much more if they all come together in these shared areas. In the individual workspaces, we brought all the workstation heights down to 42 inches, with six- or twelve-inch glass, so that you can see across the open office space. On each floor, there are at least two locations where you can see all the way across the building window to window—from north to south. And then from east to west, we also tried to make sure that we were able to maintain view corridors. It was about breaking down barriers. So much of what the SFPUC does is one organization depending on another; it’s like the water coming from Hetch Hetchy Reservoir—as it flows towards the ocean, it passes through power plants and creates hydroelectric energy, becomes our city’s drinking water, makes its way under our city in pipes, and is then sent to a local treatment plant. From one SFPUC division to another, from start to finish. 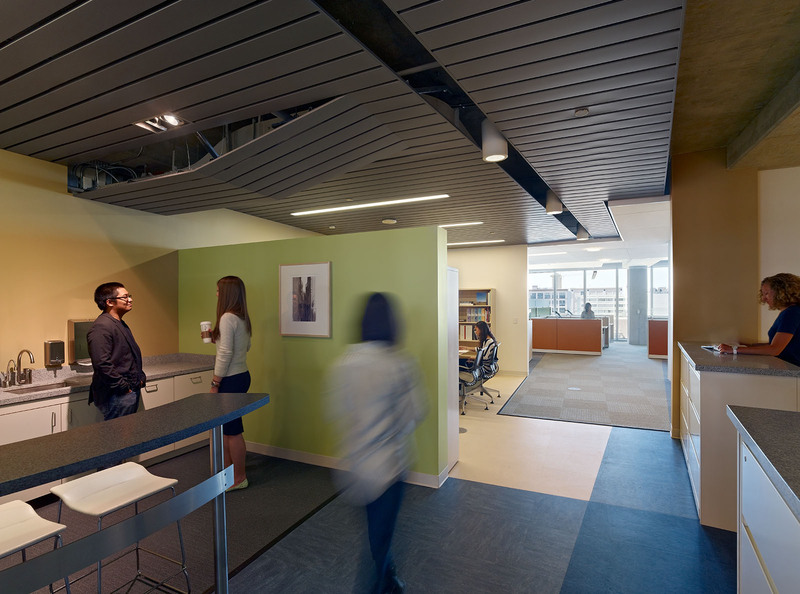 While working within the existing strictures and making the building truly sustainable, we wanted to find ways to create that flow in their work environment.